Beaded in ceramic beads that have been glazed in a rich sea blue color, this handmade beaded bookmark has been designed to be ideal for marking a reader's place with their own sense of style. 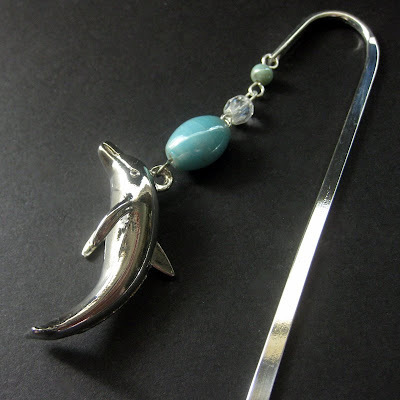 The long beaded tassel dangles down the spine of the book, a silver plated 3-D dolphin charm at it's end. The tassel is attached to a matching silver plated steel book hook with smooth sides and a graceful shape that is meant to slip between the pages of the book and mark the reader's place with ease.